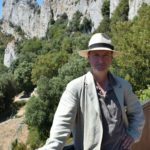 At the end of last year, we shared the news that South West based historian and novelist, Ian Mortimer had won the Winston Graham Historical Fiction Prize, administrated by the Royal Cornwall Museum, Truro. In celebration of the news, we reviewed the winning novel Outcasts of Time and interviewed Ian. 1348 and the Black Death grips England. In the midst of the despair and devastation of the disease on the country, two brothers bravely make their way towards home. Who knows what will await them there or how their lands will have changed. The journey is perilous and grief and besiegement meet them at every turn and then, John, a righteous man makes a decision which means that he and his brother William will soon face certain death. Then, a mysterious voice offers them a choice: they have six days left to live. They may either return home and live out their final days, or they may search for salvation in the future. The condition is that they must visit six centuries in their remaining days, with each day beginning ninety-nine years and one day after the last. Seizing the opportunity to save their tormented souls, John and William opt to travel time. The centuries are not kind to them. Their lands have changed, their families are long since dead and they do not encounter many whom they can call friends along the way. Difficult decisions compete with difficult times and the brothers soon realise that even small (and at times misguided) acts of altruism may not be enough to save them. Utilising Mortimer’s clear enthusiasm and well-evidenced knowledge of Medieval England, the prose is filled with authentic details which plunge the reader into a journey through time alongside the protagonists. At times unforgiving and offering the reader a starkly harrowing portrait of life in the period, the centuries are navigated with clever and thought provoking narration. The trials and tribulations of the brothers and the impact of these on their remaining days is of course, the principle focus here but offset against these are moments of surprising humour and witty handling of the various changes experienced by the characters. 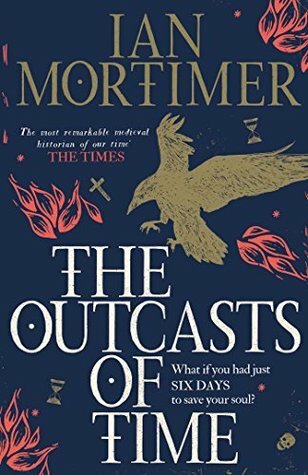 A pacy and intriguing read which plays with genre constructs and leads the reader on a journey alongside the narrative, Outcasts of Time is a thoroughly recommended read set in some recognisable locations not too far from the Literature Works office, yet another bonus in our book! Outcasts of Time is available now, published by Simon and Schuster. Many thanks for the congratulations. But, actually, I can’t tell you anything at all about the process of submission for the simple reason that I did not submit the book. My publisher did – but did not tell me. No one mentioned it even when the short list was published! The first I knew about it was the email telling me I’d won. I’d just been for a run, came back in – all flustered and out of breath – and saw a strange name in my secure inbox, which is not supposed to happen. So I read the said email, and understood, and started to grin like a Cheshire cat! Outcasts of Time is a novel which experiments with the notion of timeslip historical narrative in an interesting way. Can you tell us a bit about the importance of time travel – why was it is so important that the protagnists remain firmly of their time and that the pivotal six days of the novel happen over six centuries? It’s important that John and William do remain ‘of their time’. It’s key that John in particular remains a man of the 1340s, so that when he has to confront the Reformation he is forced to ask if the spiritual good of creating a religious sculpture in the 1340s is not absolute but only applies in one time and not another, and can actually be an evil in 1546. There’s the rampage he goes on in the cathedral in 1744, when he lambasts what the Church has become – he could not do that unless he were committed to the medieval values with which he grew up. And remember the lecture he gives to Father Harington in 1843 about security and community, and how much better things were in the 1340s. And of course there’s his reaction to seeing planes in the sky – bombers – which he interprets as crosses, a very medieval reaction. Also, when he and William discover mirrors and clocks in the 16th century, it’s important that these developments aren’t just novelties; their medieval reactions show that the idea of the self and the nature of time also are subject to change. Taking a man from the fourteenth century and having him give his reaction to the ways in which life has changed since allows us to see changes not from the perspective of looking back but from the point of view of them being new developments, and as threatening as they are seemingly advantageous. If you ask anyone today whether the railways were a boon to society in the 1840s, he or she will almost certainly say they were; but when they sucked the life blood out of so many small market towns, removing the young and leaving the old, breaking up families and destroying the sustainability of so many rural businesses, it is far from apparent that they were a benefit at the time. This different perspective is not often represented in fiction, and strikes me as being worth exploring. As for the six days, each one 99 years apart, this was to represent enough change and yet not too much, in each step. So the juxtapositions of time still retain some meaning and the reader is not overloaded with social changes by each chapter covering too great a sweep of time. The novel has at its heart the story of two brothers. Alongside the larger themes, there is an exploration of the bond of family and brotherhood. This is something that changes and develops over the course of the plot. Why was it important that John and William took this journey together? Yes, the book is wrapped up in the idea of what family is, in many various ways. This to me is an important part of understanding the past. My own understanding of history began through my family, as a young boy, and family and local history continue to inform me about the past in important ways. They offer a specific and detailed view on the past when I am discussing society in general terms, so they are very valuable as checks and examples. The reason that John and William undertake this journey together is down to their loyalty to one another. Early on in thinking through this story, it seemed to me that it needed a ‘love’ element. Traditionally we put romantic love at the heart of a novel. In this case, that wasn’t possible, so brotherly love was the next best thing. And yes, it is informed by my relationships with my own brothers. Our father’s garnet ring, given to me by one of my brothers, gave me the idea for the ring in this book, which ends up being the main character’s only possession from his own time at the end. I am wearing it as I type this. What does a typical ‘writing day’ in the south west look like for you? There is no such thing. If there were a pattern in my working life, it wouldn’t be typical for me. I hate routines and I pity those who have to obey them. They are a sign that one is not free to do as one pleases. As for a ‘writing day’, that strikes me as being as odd as designating a ‘wearing shoes day’ or ‘teeth-brushing day’. Any day and every day is – or could be – a writing day. I don’t set aside time for work. I am as likely to be working when sitting on top of a tor or walking around a museum as I am when in my library or study. What makes me a writer is not really the time I spend at the computer but the ideas I have – and they could occur at any time: in the middle of the night, on holiday, on a walk, or cooking a meal. The only rule I stick by is a piece of advice I was given by the novelist Richard Masefield. He came to my school in the autumn of 1984 to talk about writing and I, having learned that he was the second cousin of the poet laureate John Masefield, asked him if the great man had given him any advice? He answered that he had few recollections of him but that one thing he did remember was this line: ‘Never leave the house without a pencil and some paper.’ That advice stuck with me too. I always take paper or a notebook and at least two pens with me wherever I leave the house. That is why I can work in different places, which makes me free, and that freedom is the lifeblood of my imagination. Image: Copyright, Ian Mortimer 2016. Details of how to submit to the Winston Graham Historical Fiction prize 2020 can be found here.